Shares of Mahindra and Mahindra Ltd have fallen 8% in the last two trading sessions, after sales of both tractor and utility vehicle (UV) segmentsdisappointed the street. The 6% year-on-year drop in tractor sales in December was only the first big contraction after impressive growth rates over the past two years. Therefore, some analysts say that it is too early to call this a slowdown. This comes ahead of the launch of the Mahindra XUV 300, the automaker’s latest salvo in the compact SUV segment, and after the Mahindra Alturas G4 went on sale. 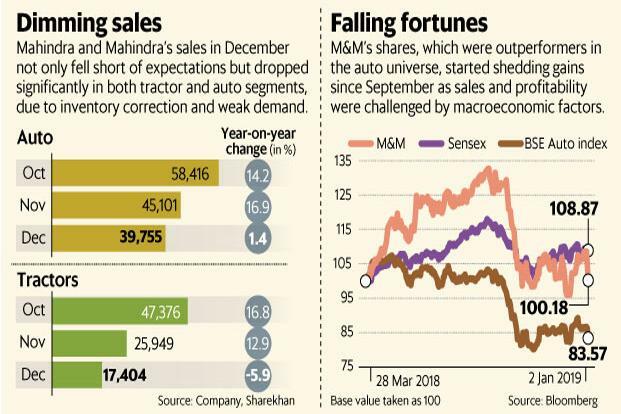 However, Mahindra’s December sales were way below consensus estimates on the street and, unless sales pick up in the coming months, it will be difficult to not come to the conclusion that the slowdown will continue. The rabi crop (winter season) sowing has also been lower than expected. This means the demand for farm equipment will be muted. A report by brokerage firm Jefferies India Pvt Ltd said that the current tractor upcycle started in the first quarter of FY17 and has completed its 10th quarter. Historically, such cycles have lasted an average of 11 quarters, with the maximum being 17 quarters. Compared to all other auto segments, the tractor cycle looks the most “peakish”, it said. It’s important to note that tractors enjoy higher profit margins and comprise nearly three-fifths of the company’s Ebit (earnings before interest and tax). As such, if the tractor cycle turns, it will be a big blow. However, that’s not all. There was a double whammy in store for Mahindra, with growth in the automotive segment narrowing to 1.4% in December compared with 14% and 17% in November and October, respectively. Within the auto segment, UV sales were flattish in December when compared to the year-ago period. Both the Mahindra management and analysts concede that tight liquidity and stiff competition, along with inventory clean-up by the company, have stymied growth. A report by ICICI Securities Ltd suggested that the current weakness in retail demand may be prolonged. “Consumer sentiment for discretionary purchases is at a 32-month-low and 64% down since March 2018, while Google Trends data indicates a 5-year-low interest in the ‘car’ keyword search in top-8 cities of India,” said the report. The silver lining is that new launches in the auto segment in the next two-three months may improve sales. Besides, amid the gloom, growing light commercial vehicle sales have stood out. However, the company has to battle multiple headwinds. The high base of January and February 2018 may continue to moderate growth rates. Lower sales volumes coupled with discounts to clear inventory, implies lower realizations in the near term. Meanwhile, new launches increase marketing costs. These factors will weigh on Ebitda (Ebit and amortization) margins, which had already shrunk by 150 basis points in the September quarter. A basis point is 0.01%. Further, competition is set to increase in the UV segment, given that most of the launches in FY20 by the industry are in this category. Analysts also reckon that the new BS-VI emission norms may hurt diesel vehicle demand, which is detrimental to Mahindra. A consistent cut in earnings since August, when auto sales showed the first signs of weakening, is therefore not surprising. The stock, which was an outperformer earlier, has unsurprisingly fallen 30% since mid-September.